Your emotions and thoughts are, in the main, manufactured by the image makers. You cry when they push your buttons. You laugh when they push your buttons. You become indignant when they push your buttons. And all it takes to push your buttons is to put before you a cleverly-crafted, striking image. You have been subjected to systematic Pavlovian conditioning over many years. You salivate when the media tell you to. There is another aspect of manufactured emotions that the public should be made aware of. In addition to making these images very startling in order to arouse the desired emotions in the public and steer them down blind alleys to non-action; those who are controlling society are also doing their best to make people’s everyday lives as grey, banal, boring and marked by drudgery as possible. Against the grey background of the public’s manufactured lives, the manufactured images are all the more startling – and the public is all the more hungry for some color, some excitement – to feel something. I know it’s unpleasant to admit that we’ve been conditioned. I went through the process of admitting that, bright a bulb as I thought I was; I too had been duped and conditioned It’s humbling and disturbing to realize that the techniques developed in labs on animals have worked on me too. But there is no getting free of the manipulation until we admit this to ourselves. Once we get over the ego hurtle of realizing what has been done to us and accepting that we fell prey to it, the conditioning becomes painfully obvious and we are no longer subject to it. We can work our way out of a trap only if we realize that we are in a trap. I cannot stroke your egos and tell you what you want to hear about this. You must become the Masters of both your thoughts and your emotions. Until you master your emotions and your thoughts, you will be slaves to The System. Now realize this has been done to your Psyche not by one brand, but my countless brands since your birth. It is done again and again, every day, everywhere you go. 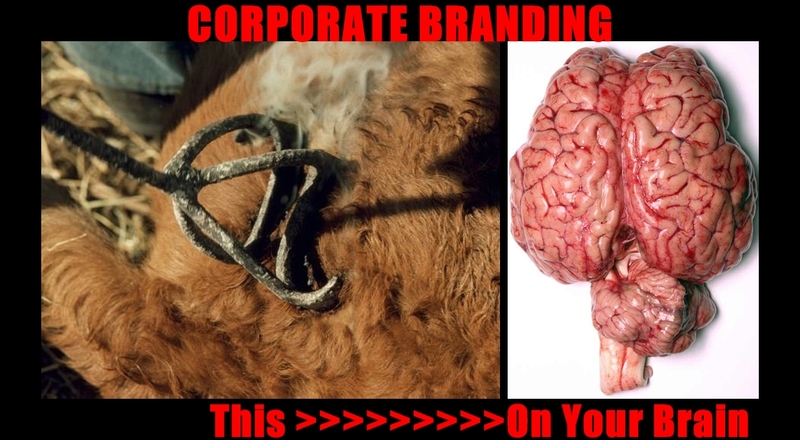 You cannot go out a day in your life without having your Psyche assaulted by a hot Brand. It is done to your children too. Do you see now how much scarification has been done to you and to those whom you love? Are you outraged enough yet to stop the assault?